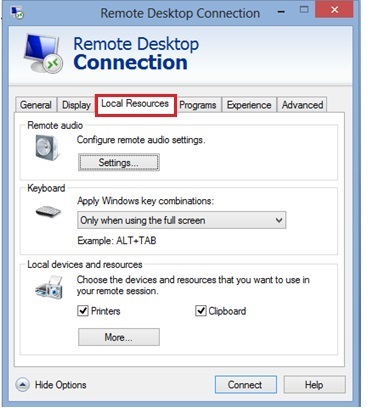 Connecting to other computer by using remote desktop client is fairly simple in Windows 8, so that you can use the programs, access the files or even use the printer on that connected computer. 1) Move your finger or cursor to the upper or lower right on Start screen in order to open the Charms bar, after that click on Search charm. 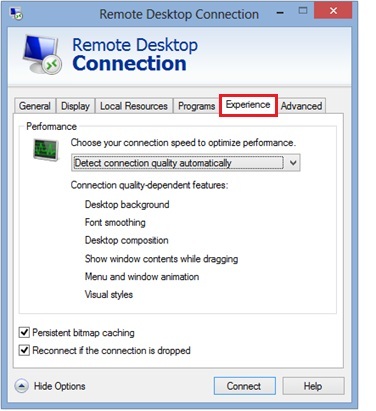 2) Type remote in Search bar, after that click on Remote Desktop Connection. 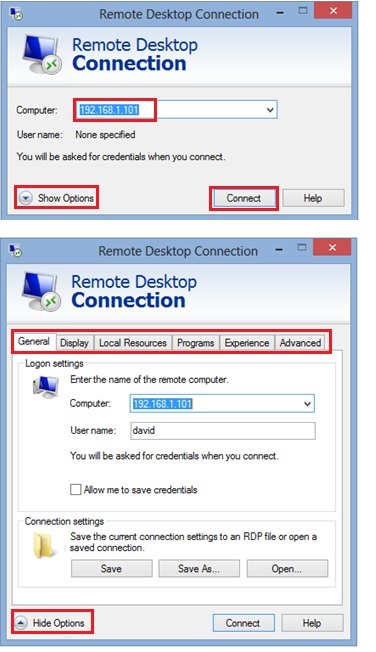 3) Once the Remote Desktop Connection client appears, you can go ahead to type the IP or domain name of remote computer and then click Connect to connect to it. Note: If you click on the Show Options, you will be shown more options as shown in windows below. You can ignore them if you just want to use the default settings. 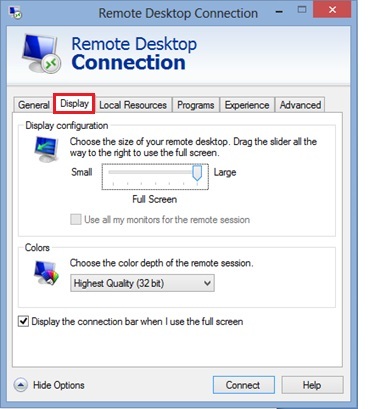 Note: You can click on Display tab to choose and adjust the size and also color depth of remote desktop. Note: If you click on Local Resources tab, you can configure audio and Windows key option on remote computer. You can also choose printer, clipboard or other devices and resources that you want to use in your remote session. 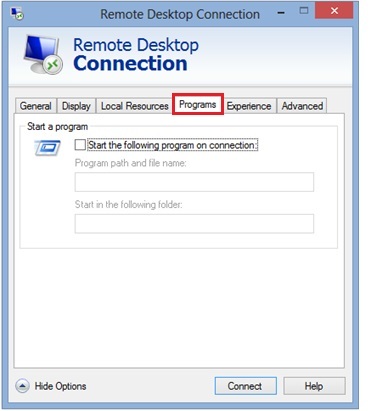 Note: You can also configure and decide what program will be started on remote computer after connecting to in Programs tab. Note: You can also click on Experience tab to choose the connection speed in order to optimize performance. 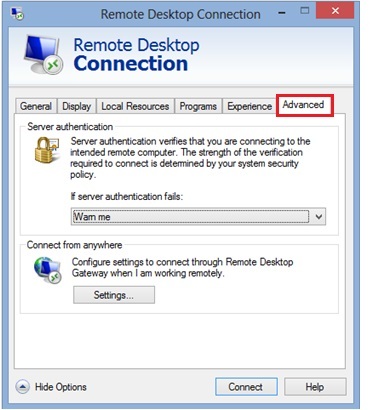 Note: Lastly the Advanced tab provides you some options to configure when server authentication fails, and also configure settings to connect through Remote Desktop gateway when you work remotely. Return to top of "Connecting to Other Computer with Remote Desktop in Windows 8"! !